• Great News for Passenger Rail! Senator Lesser will speak on the topic of expanded passenger rail service for our region. This event has been organized by Sixteen Acres Branch Library as part of a series of events related to Earth Week. In Connecticut a controversy is swirling between the Hartford Courant, the Connecticut DOT, and the legislature over CTDOT’s decision to lease 16 former MBTA coaches from the Massachusetts DOT for the planned Hartford Line service. The Hartford Courant, through their news and editorial pages, contend that CTDOT made an ill-advised decision when it decided to lease 30-year old coaches from MassDOT. The Connecticut legislature has held meetings with the DOT Commissioner to discuss this issue and is considering public hearings on the topic. Its important to remember that the older coaches used by some passenger railroads in this country are perfectly safe to operate as long as they are properly maintained and inspected. As example, the Amfleet I coaches used by Amtrak for its service between New Haven and Springfield are all over 40 years old. As of last week, according to the Courant’s reporting, CTDOT has received four of the rehabilitated coaches at its yard in New Haven. Four other coaches were at a Rhode Island facility for painting and rebranding. Eight of the coaches were still in Massachusetts. It is expected that Governor Dannel Malloy will formally announce the official start date for Hartford Line service when he cuts the ribbon at the new Meriden station on April 19th. At this event it should become clear how the State of Connecticut plans to move forward with the launch of this new service in May 2018, or not. The Connecticut Department of Transportation’s contractor for the CTrail Hartford Line service, TransitAmerica Services and Alternate Concepts, started running non-scheduled test trains between New Haven and Springfield in early March. These trains serve as training for locomotive engineers and train conductors to learn the tracks and territory between New Haven and Springfield. 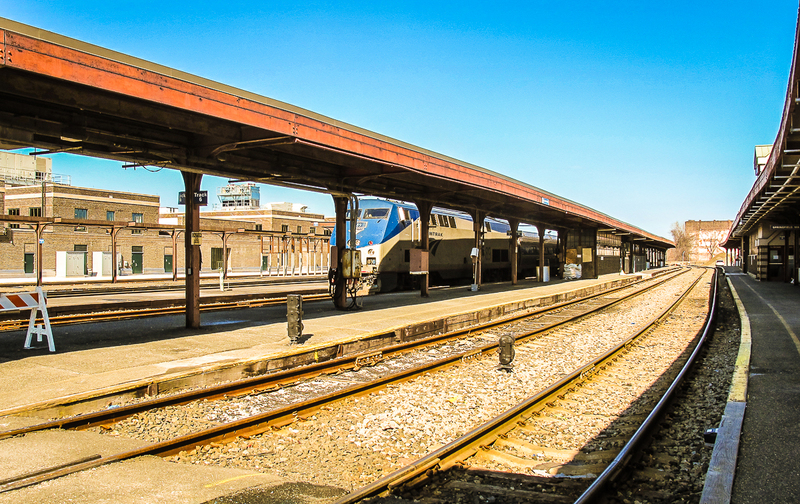 In a related development, CTDOT has indicated that an agreement is now in place so that Hartford Line tickets will be valid for travel on all Amtrak trains between Springfield and New Haven when the new service starts, with the exception of the Vermonter. This means that with a Hartford Line ticket passengers will be able to board any Amtrak train on this line (except the Vermonter) without the need for a reserved Amtrak ticket. 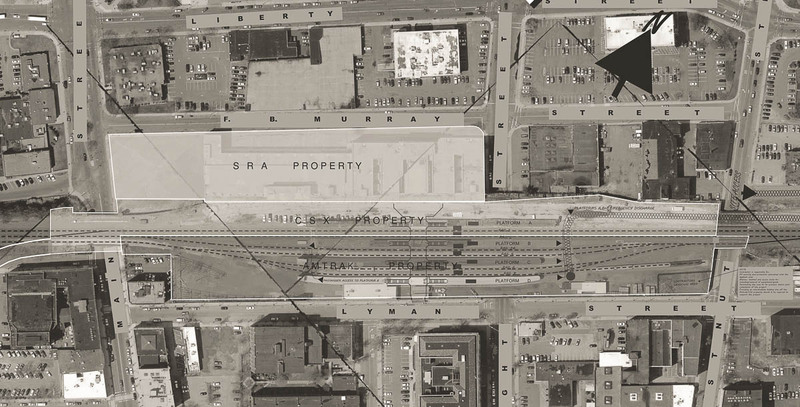 Earlier this month MassDOT released the long awaited bid solicitation for the project to construct a full-length high-level boarding platform at Springfield Union Station. The project will involve the removal of the existing low-level platform between tracks 4 and 6 (known as Platform C) at Springfield Union Station. In its place a full-length high-level platform will be constructed. 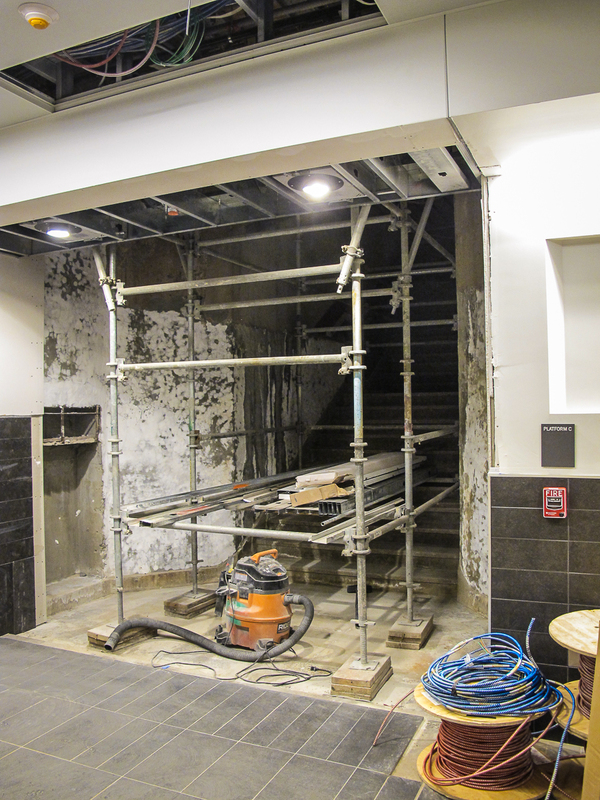 Passengers will access the new platform via a refurbished stairway (known as stairway 5) on the west side of the concourse level or via a new elevator from the center of the concourse level. The historic stairway on the east side of the concourse level (known as stairway 6) will not be reopened as part of this project. Bids for the project, which is valued at $6.5 million, are scheduled to be opened on April 18, 2018. 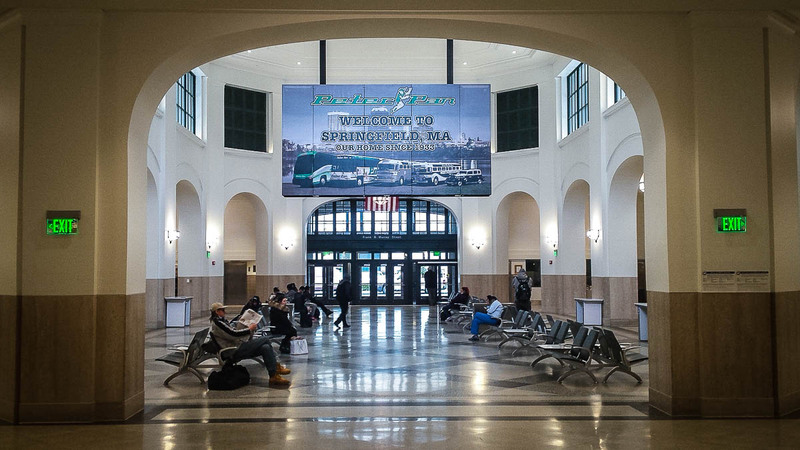 Here are two notable images from Union Station that we thought would be interesting to share. 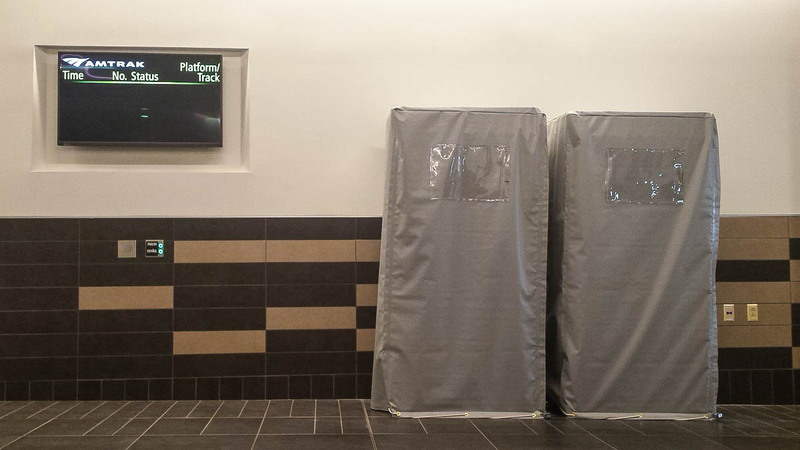 Some have asked, “what inside the gray boxes down at Union Station?” The answer — the ticket machines for the CTrail Hartford Line service. The machines are in place and wired up but will remain covered until the service launches. The screen on the left will eventually show departure information for Amtrak trains (and we hope CTrail Hartford Line trains too) from this station. We don’t have any information on what the arrangement was that allowed this Peter Pan Bus promotion to be placed on the back side of the information board in the main waiting hall. One would assume that Peter Pan is paying quite a lot of money for signage in such a prominent location. Great News for Passenger Rail! To make a long story short — the recently approved Federal Fiscal Year 2018 budget includes historic increases in funding for Amtrak, passenger rail, and transit at the federal level. 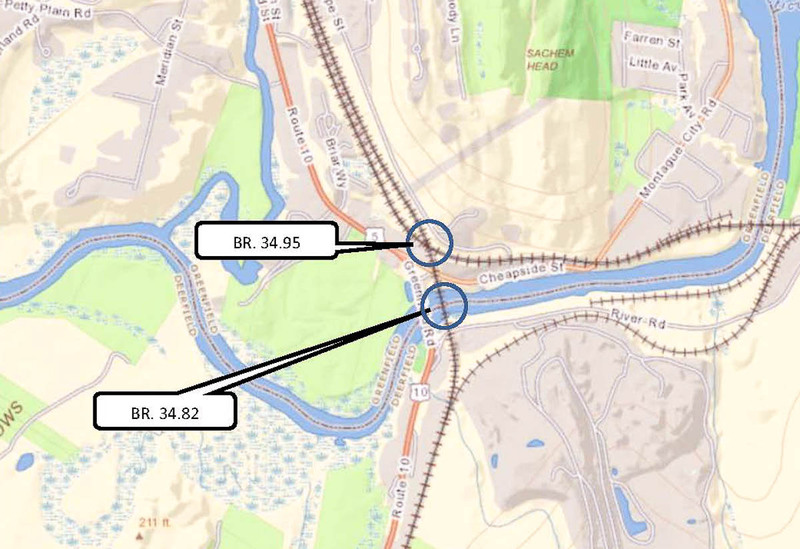 MassDOT has issued a bid solicitation for tie replacement and the installation of a second main line track on two bridges on the Connecticut River Main Line (CRML). 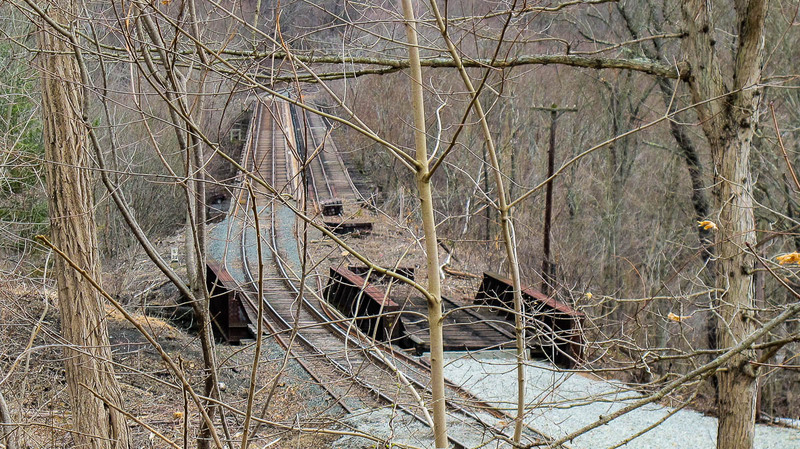 The first bridge (known as Bridge 34.82)¹ carries the CRML high above the Deerfield River and the second bridge (known as Bridge 34.95)¹ carries the CRML over the Pan Am Southern’s Fitchburg Main Line and the so-called Greenfield Running Track. Both bridges are shown on the map and in the image below. The project calls for the installation of 1,650 new wood bridge timbers, structural modifications on each of the two bridges, installation of a retaining wall, construction of new track, and the installation of 1,500 track feet of continuously welded running rail and 3,600 linear feet of bridge guard rail over bridges 34.82 and 34.95. Work will also include spot ditching, maintenance crossing installation, track surfacing and aligning, as well as removal and disposal of debris. Bids for the project, which is valued at $3.1 million, were scheduled to be opened on March 29, 2018. The project is expected to take 320 calendars days to complete once MassDOT issues a Notice to Proceed to the contractor. ¹These numbers indicate the milepost (a distance measured in miles) along the rail line. On The Connecticut River Main Line this distance is measured from Springfield. Vehicle collision with freight train | Northampton Ma. The crossing is for a railroad siding that leads from the MassDOT-owned Connecticut River Mainline to the Packaging Corporation of America facility on Route 5 in Northampton. Apparently the driver of the vehicle did not notice the flashing red warning lights at the crossing. Active signals were installed at this crossing just over a year ago, after a similar accident. Senator Eric Lesser spoke on WGBY-57’s program Connecting Point on March 14, 2018 on the topic of the future of East-West passenger rail service in our state. Anyone interested in the idea of connecting eastern Mass. with western Mass. by rail should be encouraged by the political leadership on this issue that Sen. Lesser continues to offer to all of us. 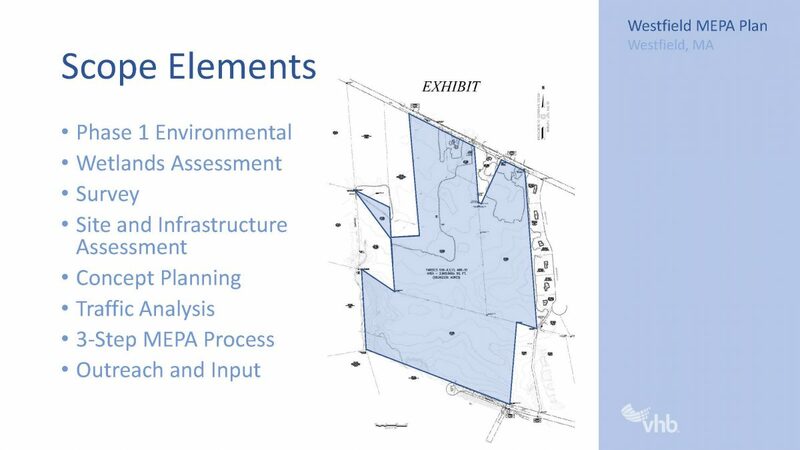 The City of Westfield is moving forward with plans to develope a 66-acre industrial park on city-owned land between Turnpike Industrial Road and Cabot Road. It has been reported that the design will include provisions for possible rail access into the property. If this were to happen the site would be served by the Pioneer Valley Railroad which already serves a number of freight rail customers in the vicinity of the proposed industrial park. Former Mt Tom power plant, Holyoke, Ma. The Berkshire Scenic Railway Museum (Lenox, Ma.) has acquired a rare 1941 Electro-Motive Division locomotive from the now dormant Mt. Tom power plant located in Holyoke, Massachusetts. The 77-year old locomotive (shown above) was picked up from the power plant site by Pan Am Railways in late February and is now resting at its new home in the Berkshire Scenic’s rail yard.